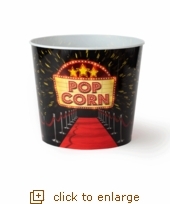 Walk the red carpet at your favorite movie with these new JUMBO popcorn tubs! Each jumbo tub has a 9-quart capacity so it holds over a full batch of delicious Whirley-Pop popcorn! Coordinating Large and Small sizes are also available!